If you prefer to use natural flea remedies, without harmful chemicals, why not try some of our home remedies below? They use all natural ingredients that won't harm your pet, but will certainly help to get rid of those pesky parasites! "...I'm reluctant to use toxins on my dog just to get rid of his fleas, are there any alternative natural flea remedies that I could use?..." I've heard that question asked many times, so I thought I'd answer it here. When you look at the chemicals listed on commercial flea treatment packaging, it's understandable that many owners are turning to more natural flea remedies as a safer option. And the good news is that it is possible to free your Cocker Spaniel and your home of dog fleas, without the use of harmful toxins. You've probably got the makings of some natural flea control treatments already sitting on shelves in your kitchen cupboards. Simple, natural ingredients that won't harm your pet but will kill those pesky fleas! Here are 10 easy ideas for effective natural flea removal, but don't just take my word for it, why not try one or two of them for yourself? 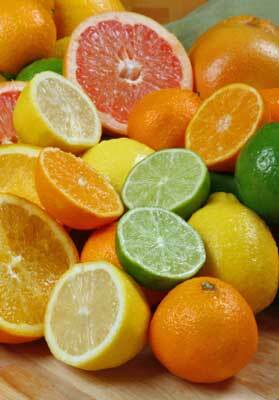 Citrus oils are often used as a natural flea remedy for controlling, repelling and killing dog fleas. The oils are best diluted with water which can then be poured over your dog in the bath or used in a clean spray bottle to dampen his coat. But be careful, if the citrus oil isn't sufficiently diluted, it may irritate your dog's skin. Make sure you get behind his ears and rub it into the top of his head (a favorite meeting place for fleas), but place your hands over his eyes to protect them as you spray. The base of your Cocker's tail and under his 'armpits' are also places where fleas like to take up residence so make sure you give those areas a good drenching. Re-apply every four days or so. It's much safer spraying natural lemon juice onto your dog's coat than it is to spray him with chemicals and having to do it around twice a week is a small price to pay for the benefit, don't you think? If you like the sound of this, but don't have any citrus oil handy, you can easily make your own citrus wash using grapefruits, oranges, lemons or limes, here's how. Cut a couple of lemons or a selection of citrus fruits into slices or quarters (it doesn't matter which) and place in a heatproof bowl. Top Tip: Score the skins of the fruit before you cut them to help release more of their oils. Squeeze to release the juice. Pour about 1 pint of boiling water over the fruit and leave to cool or leave overnight. The next day you can strain the pulp and use the liquid in a clean spray bottle or sponge directly onto your dog's coat. 2. Bubble Bath: A Natural Flea Control? Bubbles and soap suds are a great way of getting rid of adult fleas because they can't get a grip on the hair and they literally drown in the watery soap suds! Using your favorite dog shampoo (baby shampoo works fine too) get a good lather going and wash your dog. Make sure you create lots of bubbles! When he's clean, rinse him thoroughly (twice is always a good bet, and then once again to make really sure there are no more soap suds left in his coat). Once his coat is squeaky clean and well-rinsed it's time to dry him off. If you want to double up on effectiveness, you can use the lemon recipe above in the final rinse. Alternatively, you can add a little mild liquid soap to the citric liquid and use it to bath your dog in the usual way. Top Tip: Another effective way to kill fleas is to place a small bowl of soapy water next to a (safe) night light near to where you dog sleeps. The adult fleas will be attracted to the warm light and will drown in the soapy water. Apple cider vinegar has so many good uses and getting rid of fleas on your dog is one of them. If you want to make a spray, you can do this easily by pouring two tablespoons into a small spray bottle and topping it up with water. Spray it onto your Cocker Spaniel's coat and let it dry naturally. Repeat this every 4 days until the fleas have gone. You can also add it to your Cocker's water or food and as it builds up in your dog's bloodstream it's said to make his blood unpalatable to fleas. I add a splash to Max's fresh drinking water each morning and also use it as a spray. I use unfiltered organic apple cider vinegar because its more natural. Apple cider vinegar will help to give a sheen to your Cocker's coat and can also help to strengthen his immune system, so it's a win-win situation all round! Of all the natural flea remedies on this page, I think this is the most effective! White vinegar is also a natural flea control for our dogs. Was that a flea I saw? Don't be silly! Simply make up a solution of equal parts white vinegar and water and spray onto your dog's coat. One of our regular visitors (Stephanie, you know who you are!) 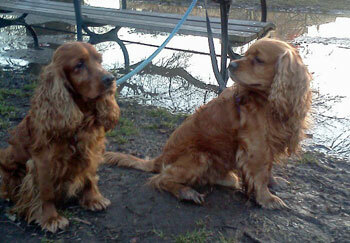 sent us this great photo of her Cocker Spaniels. Stephanie sprays her dogs' coats with vinegar to repel fleas naturally. She swears by it as she says it make their coats beautiful and glossy and it's not expensive. It's a great cheap alternative to those expensive, chemical, de-lousing pipettes! If you grow rosemary or lavender in your garden - this one's for you, but even if you don't it's so easy to grow, either in pots or in a border. Snip a few sprigs off the plant and allow to soak for an hour in a small bowl of boiling water. When the water has cooled remove the sprigs and strain if necessary. This liquid is 'concentrated' and will need to be diluted before you use it. Top up with a litre of warm water and add to a spray bottle. 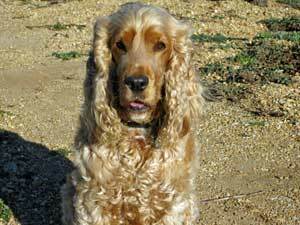 Spray your Cocker's coat liberally with the scented water and let him lie out in the sunshine to dry off naturally. Cedar chips or shavings placed inside a pillow case, or your dog's bed is said to repel fleas because, apparently, they don't like the smell...how on earth did they work that one out? The cedar chips must be contained, especially if your Cocker Spaniel enjoys chewing sticks of wood such as cedar could make him sick. If your dog also has an outside kennel, don't forget to use the cedar there too. It's said that fleas don't like the taste of garlic (again, how on earth do they know that?)! Mix a small amount in his food and the fleas will be falling over themselves to jump ship. You can buy capsules from health food shops, or you can use powdered garlic. However, my research shows that large amounts of garlic can actually harm your pet. As I wasn't able to find out what defines a 'large amount' of garlic, I strongly recommend that if you plan to use garlic as a flea deterrent, you mention it to your vet first to get his or her opinion on safe amounts to feed your Cocker Spaniel. The same applies to brewer's yeast as applies to garlic...fleas don't like the taste! You can buy brewer’s yeast tablets to add to your pet's food, but I would check with your vet first. He or she will be able to advise you on the correct dosage according to your pet's health and weight. Pennyroyal is a plant that belongs to the mint family and it's said to deter parasites. It can be made into batches of home remedies for fleas and used accordingly. You might want to consider planting it in the garden near where your dog usually plays or lies and you can also plant it in pots on the patio to deter fleas. Just be careful if your dog tends to eat plants as it can be poisonous. The trusty old flea comb is one of the most natural flea remedies there is and it's really effective for combing out those pesky parasites. Have a small bowl of warm water by your side as you comb through his coat so that you can dip the comb into the water to remove the fleas from the teeth. (The fleas will drown in the soapy water). Unfortunately, a flea comb won't remove the eggs, you'll need to use a rinse treatment or spray after combing to do that. Comb your pet's coat every day until all the fleas have been removed. Some of the eggs may hatch but if you comb regularly you're bound to comb them out. Once you've finished combing your Spaniel thoroughly you can spray his coat with your favorite natural flea remedy. Essential oils are stored in tiny bottles because they're very concentrated. They need to be diluted properly otherwise the oils may irritate any skin they come into contact with. Always follow the manufacturers instructions. You'll never need more than a few drops for each spray bottle. Natural flea remedies are a simple alternative option. It's simply a matter of choice. As with any product, natural or otherwise, it's always best to talk them through with your vet first before trying any of them on your pet. Keep an eye on his skin to make sure he doesn't suffer a reaction, allergic or otherwise. Don't forget to keep his bedding clean. You might also like to spray your Spaniel's bed with one of the natural flea sprays on this page; not only will it help to repel fleas, it will also help to keep his bed smelling fresh. After vacuuming, you might want to spray your carpets and soft furnishings with one of the diluted essential oils, however I recommend doing a small patch test first to make sure it doesn't stain. And if you don't have carpets, you can use it in some warm, mildly soapy water to mop the floor! I hope I've helped you with your flea problem and hope you find something that works for you. If you have any natural flea remedies that you'd like to share with us, you can drop me a line here. And if you'd like to learn more about getting rid of fleas on your dog, simply follow this link.